After spending all day at the Magic Kingdom yesterday, it finally hit me. Summer is finally here. Technically tomorrow, but the heat and humidity is in full force. I find it hard in this heat with my marathon training and need to either run in the mornings or learn to love my treadmill (will never happen). With this heat, I find myself very dehydrated. I don't drink enough water so I am currently on a "drink 3 CamelBaks a day" regimen. 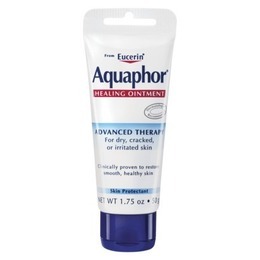 As I am always dehydrated, I suffer from severe dry skin and I have been a huge fan of Aquaphor for quite some time. Dry skin is caused by a loss of water in the upper layer of the skin and the moisturizers in Aquaphor work by forming an oily layer on the top of the skin that traps water in the skin. I not only use it on my knees and elbows for intense hydration but also use it for scrapes and burns. Have I ever mentioned how clumsy I am? I ran into a pole once while running because I was too busy talking. I always have a scrape somewhere on my body. When Aquaphor contacted me to check out their petite sized convenient flip cap tube, I was instantly intrigued. I used Aquaphor daily prior to them contacting me and was initially introduced to the product from my dermatologist. I owe Aquaphor for healing the multiple blisters I received after my multiple half marathons in a 4 month span. So the good people at Aquaphor sent me an amazing package to help keep me hydrated during the summer. I am also slightly obsessed with their new lip balm. In addition to a ton of Aquaphor products, I also received a CamelBak, which is my new BFF and a $50 Visa Gift Card. Guess what - they want to send one of my readers the exact same package. Leave a comment below and let me know how you plan on using Aquaphor when you and your friends/family are out and about this summer! Make sure you enter through rafflecopter as this is how I select my winner randomly. If you are unsure how to use Rafflecopter, click here for a short video tutorial. You can also visit our Aquaphor Facebook page for exclusive skin tips. I will use it on the driest parts of my face and body under my sunscreen to protect it from the harsh, dry weather. I will use it on my feet. Wearing flip flops and sandals all summer dries out my heels. My hands and my feet. Both dry out really badly and could use the extra moisture. Definitely would use it after beach trips as my skin gets dry from the sun, sand and sea water! This would great after swimming in the summer heat to relieve dry skin. Thanks! Aquaphor is perfect for my dry skin when we are out enjoying summer fun. We would use this at the water park. The lip balm would be great protection for our lips! Hands, feet, arms and legs all get very dry for me and this would be very comforting and soothing to try! I used it when I nearly cut the tip of my finger off with a mandolin. It really helped heal the skin fast! I also use it so I don't chaffe when I'm running. I even carried it with me during my last half marathon so I could reapply if necessary, which I didn't, but I was able to share it with other runners at the start who didn't have their own little tube with them! My kids always end up with dry skin! Aquaphor helps so much! Using it on my feet :) We're always in flip flops!!! I love using aquaphor after I shower. It really keeps the moisture in! definitely plan on using it on my feet since I'll be wearing flip flops daily! I will be using aquaphor to help me with sunburn . Thank you! 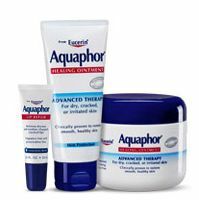 I Will Use Aquaphor To Keep Me Moisturized From The Summer Heat And Swimming! We have Annual Passes to Disney World and go to the parks a LOT...I'll pop one of these small tubes in my "in park" bag. On my feet... often barefoot doing yoga and pilates! for dry patches from sun damage!!! Oh we would use this all the time when family is over swimming. We have a pool so the family comes over all the time. This would be great! We use Aquaphor for my daughter's eczema and when my husband burns his head! This contest came at the perfect time, as I am looking for a new moisturizer that works on my very dry 'after the beach' skin! I would definitely take it on all my pool/beach adventures. I've never tried Aquaphor before, but my skin gets so dry in the summer - I know it would help on those areas that get irritating! I would use this after I swim in the pool. I have noticed that when I swim in Chlorine my skins gets very dry. Also, I am a freak about my lips so I woudl love to have the lip protection!! After the pool and on hot dry days... pretty much every day down here! Before & after the pool on my face, and my daughter's feet that crack open. My face and skin get dry patches everywhere when the weather changes. I will use it on my arms and legs. I would use it for knees, elbows, shoulders. Would also love to try the lip balm. I'd use it on my hands and arms they get really dry from the weather and washing dishes. I will use it on my face so I don't get dry skin.